Graham said they played from the blue tees and that it measured “about 6,800 yards.” That would make the course roughly the same length as the one on which Bernhard Langer won the Senior PGA in late May, an event in which over four rounds nearly half of the field’s recorded scores were 74 or higher. A score of 84 would seem plausible. 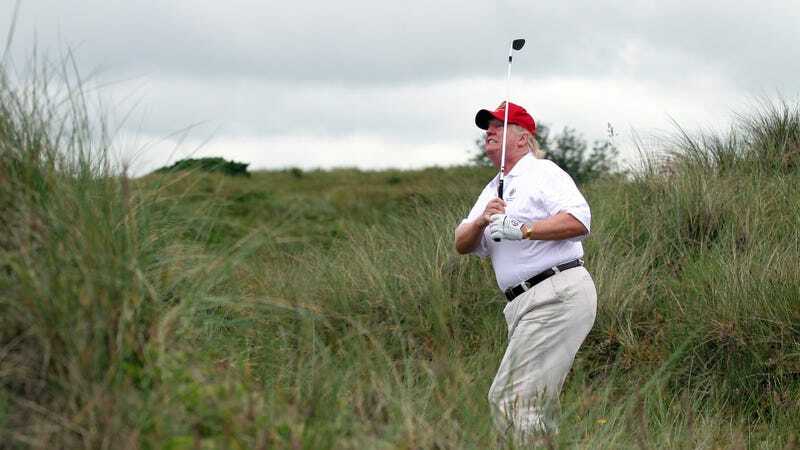 Trump is a good golfer. But a 73, from a 71-year-old who plays often for a president but infrequently for a low-handicap golfer? Unlikely, to say the least. As a rough comparison, the Hall of Fame golfer Hale Irwin, who turned 72 in June, has a scoring average of just over 73 in the seven Champions tour events he has played this year, with an average drive of just under 250 yards. Graham said Trump’s average drive was around 250 yards. At the end of the round, he owed the president $30, but had only $5 with him, which the president accepted. The senator was asked if Trump asked for Graham to announce the score to the world. He did not, Graham said. Congratulations to Lindsey Graham for unlocking a new level of fawning sycophancy. And for saving $25.